Excellence in Leadership at Alliance - Alliance Transportation Group, Inc.
Jim Harvey, AICP named Vice President of Planning for ATG, Inc. Jim joined Alliance in 2003 as Director of Planning and leads a team of planners, modelers, and technicians in a variety of transportation and transit studies nationwide. Jim has over three decades of modeling and project management experience in both the public sector and private sector. Please join us in congratulating Jim in his new role at Alliance! 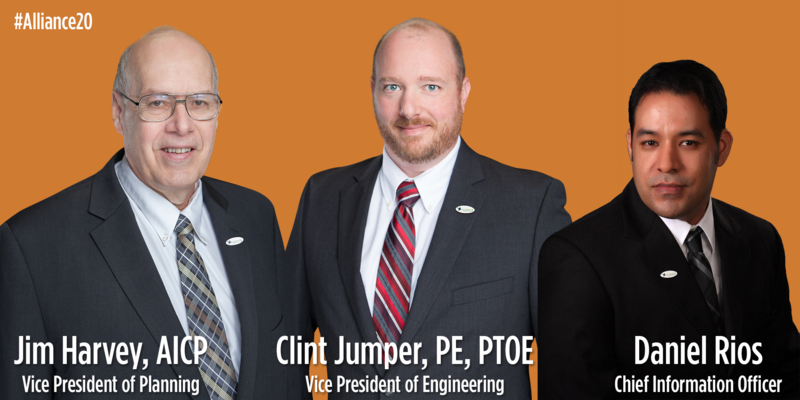 Clint Jumper, PE, PTOE is now Vice President of Engineering at ATG Since joining Alliance in 2014 as Director of Engineering, Clint has demonstrated the leadership and vision to continue the successful growth of our Engineering Division. Please join us in congratulating Clint on his new role at Alliance! Daniel Rios named Chief Information Officer for ATG Since joining Alliance in 2002 as an Intern, Daniel has demonstrated the expertise, leadership, and vision that has contributed to the continued success of the firm. Please join us in congratulating Daniel on his new role at Alliance!